Click here for audio of Episode 360. Today, I decide a story is worth telling. The University of Houston's College of Engineering presents this series about the machines that make our civilization run, and the people whose ingenuity created them. 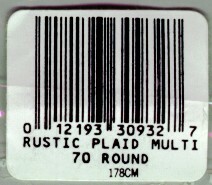 Several friends have lately said to me, "Do a program about the bar code -- about those zebra stripes on retail goods." I've been saying, "Yeah, yeah. Maybe someday." Then it hit me: the bar code was invented at the wrong time. It was no spawn of the computer age. Two engineering teachers at Drexel cooked it up in the late 1940s. That was back when computers still used radio tubes, and only government labs had them. Bernard Silver overheard his dean talking to the president of a supermarket chain. The fellow wished he could automate pricing at checkout counters. Silver went to his friend, Joe Woodland. He said, "Let's figure out a way to do that!" Their first idea was to read colored fluorescent dots with ultra-violet lights. But that limited the range of prices they could handle. Then they hit on the idea of reflecting light from black and white bars. But how could they do that, no matter which way the product passed the light? They finally patented a bull's eye pattern of concentric circles in 1952. The year before that, Woodland joined IBM. IBM studied the scheme and found that lighting sources and computers were still too primitive. The system would cost too much. So Woodland worked in other areas for several years. He studied optical character recognition, xerography, and computers. Then, in 1959, when integrated circuits and lasers came of age, IBM went back to develop a bar-code system. The grocery business was finally ready to adopt it in the late 1960s. Between '70 and '74 they agreed on a standard form of Woodland's code. By now, a criss-cross laser system could read parallel lines instead of a bull's eye. Grocery stores finally started using the system almost 30 years after it was conceived. Most modern technology grows out of itself. Computers suggest their own improvements. Transistors and lasers fairly scream to be used in new ways. The invention of the bar code was different. Two smart men went into resonance with a good idea. Woodland committed himself to it. He had it on the shelf waiting for the support technology that would make it work. So my friends were right. The bar code story is a useful one. It helps us find the line between real invention and development. The bar code was radical enough to be unusable at first. Unlike most radical ideas, this one succeeded because its inventor stayed with it. My friends were right on this one. The invention of the bar code really is a parable for our times. The bar code story is told in the December, 1989 issue of Mechanical Engineering News , a newsletter that accompanies the regular ASME magazine, Mechanical Engineering . For more on the idea of the bar code, see Episode 685.